Pink is known as the color preferred by the woman. It is well known to enhance the beauty of the woman. Yet, when pink become the colors of protest, it defines the courage of the women. Women are nowadays not victims anymore; they are also taking the path of courage, to protest against the domestic violence or the corruption of the society. In the rural India, where the women are mostly helpless in the hand of society, the name like Gulabi Gang is showing them the ray of hope. The founder of this Gulabi Gang was Sampat Pal Devi. A U.P. resident and normal housewife had shown the courage of gathering the woman to protest against domestic violence and social injustice. Even though she is a normal woman from the rural area, she had raised her voice against the domestic violence or the unequal rights of women in her own home. Sampat Pal Devi was an ordinary housewife in a village of Bundelkhand of Uttar Pradesh. She got married at the tender age of 12. After four years, while returning to her home, she heard about the drunken abuse of her friend’s husband. Unable to stop the abuse alone, she gathered the neighbors and beat the abusive husband of her friend in front of the whole society. The idea of Gulabi Gang had incorporated from there. After a couple of years, Sampat Pal Devi and her Gulabi gang also fought for the allotted amount of food and grains which are supposed to be distributed by the local fair price shops. The word gang doesn’t justify the acts of this Gulabi gang. It is normally a team of women aged from eighteen to sixty-five. They are fighting for the common social causes related to the women like domestic violence, dowry system, child marriage and much more. Along with the protest for the women, they also address the issues like land reforms, the problem related to admission in the schools, acquiring food cards from the corporations, the rights of the lower castes etc. They also help the women to set up a self-help group so that the women can earn by sewing, selling vegetables, trading commodities in order to support themselves. 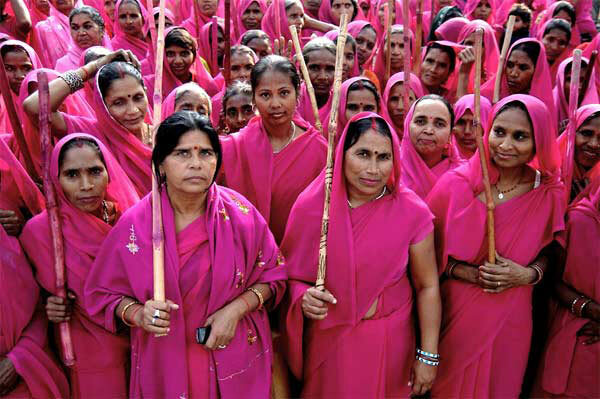 The members of this gang always wear pink saris and carry the bamboo stick as the sign of the Protestants. As the gang mainly works in the rural areas, the word of mouth is the main source of creating awareness amongst the women. The newspaper articles are also very motivating, as the women normally describe their own stories in those articles. The Gulabi gang has set up their establishments in various part of Northern India, and every station has a station head. When a complaint is lodged in any station, the station head gives the report to the main commander of the group. At first, the police are informed about the process. If the police fail to take any action; the gang addresses the issue directly. At first, the gang tries to resolve the matter by talking or educating, if the result is not desired, then the gang addresses the issue by applying force. With a huge pride, Sampat Pal Devi had declared that her missions are 100% successful in the case of domestic violence. The journey of Sampat Pal Devi with Gulabi Gang ended a few years back. Sampat Pal Devi participated in the very popular TV show Big Boss Season 6 and a number of movies and documentaries are based on her life to show her courage to take a stand against the injustice.